Hello Friends, Happy Weekend to you! 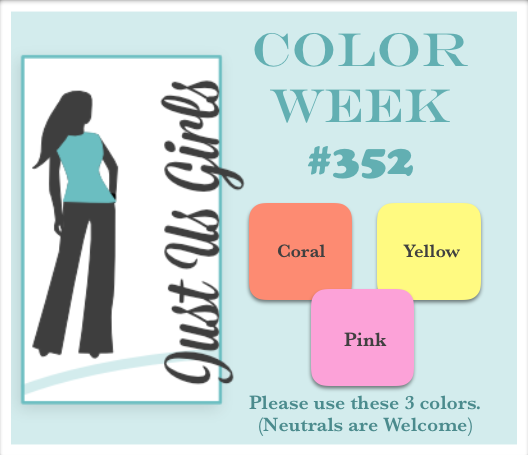 It’s Color Week over at Just Us Girls and boy do we have a beautiful color combo for you! It’s Coral, Pink and Yellow. Let me just say it may not look great together on the graphic, but boy oh boy am I in love! I found a card (by Laura Bassen whose work I adore) HERE that jump started my creativity but I wanted to make it my own, so I did. I decided to put in the empty white spaces in after I divided it into thirds. I knew I wanted to use one of my favorite Verve sets Poppy Birthday along with one of the coolest techniques…emboss resist. I will be remembering this layout, and will be using it again, for that I am certain. Categories: Cards | Tags: Card making, Cards, color challenge, embossing, Happy Birthday, rubber stamps, stamping, Thinking of you, Verve Stamps | Permalink. This is so gorgeous. Great design and wonderful colors. Wow, this card is absolutely stunning, Nancy! You knocked this one out of the park! Love how you put these colors together and the demension of the special ones that you pop out. Love the design that you did, so soft and gorgeous. This is beautiful. I love how you have used these colors and this technique. I like how you popped two of the flowers up also. Great design. Perfect layout using the colors!! I love the gorgeous flowers and the way you have sectioned off the challenge colors. Beautiful card! This is fabulous, Nancy. 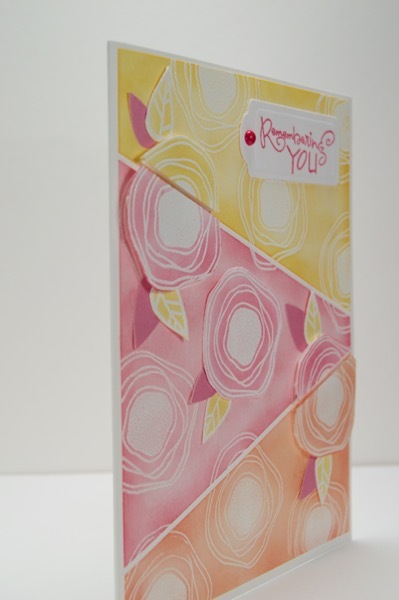 I was impressed with Laura’s card too, and you’ve done a great job using it as inspiration but making it your own. The shades go together so beautifully. Nancy, this is gorgeous! I love those beautiful flowers and the technique you used is very cool. Awesome design on this! How clever Nancy. Love how this one turned out. Gorgeous card. This is just fabulous. LOVE how you have used those colors, and cutting the panels on an angle is genius. I really, really like this card!! !